How entrepreneurs are taking advantage of a healthy specialty foods market, plus 9 tips on how you can, too. 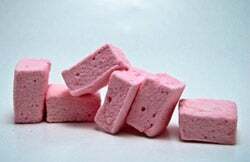 Michelle Quednow was unemployed when she decided to try her hand at selling the gourmet marshmallows that she and husband Jason made from scratch in their Lake Mills, Wis., kitchen. Family and friends raved about the sugary puffs tinged with cinnamon, dipped in chocolate and blended with peanut butter, but the couple learned they needed to make the marshmallows in a licensed commercial kitchen to sell them. So they rented space in a catering kitchen, got licensed by the health department and set up shop at a local farmers market. That was 10 months ago. Today, Quednow, who has since taken a job as a teaching assistant, and her husband, an overnight radio producer and anchor, are making a nice little profit from their cookies and cream, toasted coconut and other flavored Jazzed Up Marshmallows. They still sell them at farmers markets and have expanded to specialty stores and online. "We specialize in just marshmallows, and that's the way we want to keep it right now," Quednow says. "My husband sees marshmallows as a blank canvas -- you can add whatever flavoring you want, and you can make it completely unique, like a piece of art. When we started selling them, we wanted to make sure it would be a product that not only the kids at the farmers market would like, but that their parents would be excited about, too." The Quednows are just one example of the many home cooks turning gourmet foods into new careers and side businesses. Stephen Hall, author of Sell Your Specialty Food, says consumers are eager to try new products and that 14,000 new food products debuted in the United States in 2010. "Specialty foods is a very vigorous market," Hall says. The search for new tastes -- and the fickleness -- of American consumers drives $60 billion in annual retail sales of specialty foods, and also drives cooks from diverse backgrounds into the gourmet arena, Hall says. Though there's room for new entrepreneurs, some great products never make it to consumers because their makers fail to learn some basics about the food business. Here are nine tips to help you keep your food startup from spoiling. 1. Making the best-tasting cookie, salad dressing or marmalade is not enough. You need customers. "I tell people you can make the absolute best brownie or cookie that is out there, but if you cannot sell it, you don't have a business," says Kathrine Gregory, director of The Entrepreneur's Space, a kitchen-for-rent and business incubator in Queens, N.Y. "If you cannot sell it because it is too time-consuming to make or the ingredients are so expensive that a 10-inch cookie costs $45, then you do not have a business." 2. You need a plan. "That whole 'if you build it, they will come' thing doesn't work in the food business," says Jeanne Carpenter, executive director of Wisconsin Cheese Originals and a dairy consultant. "You have to have a business plan [and] some connections before you ever launch a product. You're going to have to figure out how your product is better, has more value and fills a niche before people discover your product and find they can't live without it." State university systems can be good resources for market research, Carpenter says, and you'll need to do some of your own research, too. "A business and marketing plan doesn't need to be a formal thing, but it should be a working document so people know what they need to do," Gregory says. 3. Find a commercial kitchen space to rent by the hour, not the month. With food products, you not only need to be licensed to make them, but you also need to make food in a licensed, commercial space in most states. In addition to commercial kitchens, Quednow suggests contacting caterers, American Legion Halls and even large churches. All have licensed, commercial kitchens that aren't as busy as restaurants. It also might be more cost-effective to rent space late at night or early in the morning. Carpenter suggests getting to know your local health inspector. "It's their job to help you, but ask for their help before you get started," Carpenter says. "The first time you see your regulator is not when they're coming to your business to shut you down." 4. Know your costs to determine your price. A good rule of thumb for price is three times your cost, Gregory says. But it really depends on a number of factors: What is the cost of ingredients? Insurance? Marketing? Printing labels? Quednow says that to keep costs down for her customers, she currently prints all their labels, but that's prevented her from getting in some local stores that want more professional packaging. 5. Ask for help. "One of the things that really surprised me is how many people were willing to help if I just asked for it," says Marisa Angebranndt, who makes whoopee pies at The Entrepreneur's Space and sells them online. "I reached out to food bloggers and people in the restaurant business, and they said yes when I asked them 'Would you mind grabbing a cup of coffee with me?'" Carpenter suggests visiting 10 to 15 successful businesses. "The first thing you'll find out pretty quickly is [whether] that's what you want to do," Carpenter says. "It seems like one of those 'duh' things, but not everyone does this. The entrepreneurs who are the most successful are the ones who do the most research and talk to the most people before they ever start." 6. It's not a 9-to-5 job... "You really don't know what you're getting into until it's 3 o'clock in the morning, and you just tried to warm up your Diet Coke," says Angebranndt, who used to be an executive administrator for a hedge fund. "I work harder for myself than I ever worked for someone else, but I'm working for myself, I'm working to make a name for myself, for a product I love and for making people happy, and that's a huge reward I never had when I was working for someone else." 7....But the job will be seasonal. Like retail, most specialty food is sold from October to December. That means that you will be working more hours and getting less sleep during these months. It also may mean your marketing budget is reserved for the holidays. "People are willing to spend a little extra money to get something good for someone they like, and $34 cheese is a justifiable gift, whereas in January, it may not be," Carpenter says. 8. Get your product in the mouths of consumers. That means getting it in stores and doing sampling and creating a website. Both Quednow and Angebranndt first started selling their sweets at local farmers markets known for gourmet items. "Food entrepreneurs should be in every arena that is possible -- direct to consumer, wholesale through stores, and online," Gregory says. 9. Keep it fresh. "One key to success is the ability to innovate," Hall says. "If your product was judged the most beautiful, best-tasting product to be introduced at the Fancy Food Show last year, then the next year, the same buyers will say 'What's new?' And you need to be able to answer that." Quednow says her husband is working on strawberry heart-shaped marshmallows dipped in chocolate for Valentine's Day, while Angebranndt says she's got raspberry-cream-filled and red velvet whoopee pies that will be ready for February, too.